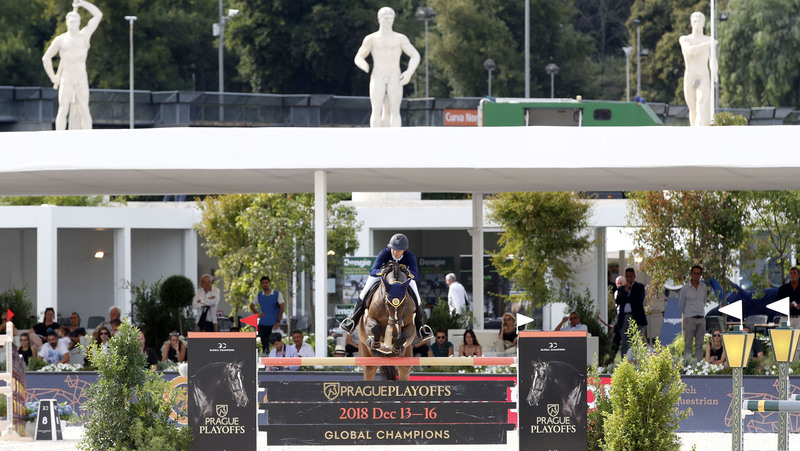 Prague Lions’ Peder Fredricson and Anna Kellnerova roared to pole position in a high drama GCL Rome first round, with the Championship ranking set for a potential shakeup ahead of the finals in Doha. The ferocious title battle between ranking leaders London Knights and Valkenswaard United took a dramatically unexpected turn, after United scored one of their worst results of the season, handing the advantage to their scarlet-coated rivals. With all teams looking to the GC Playoffs and the all-important GCL Super Cup, every point counts in the two remaining events. Tomorrow will see multiple high-stakes scenarios play out in the spectacular amphitheatre in Rome. The Knights could be untouchable, while the battles for the top four positions, and to avoid the relegation zone, will be at full throttle. Second place today went to Miami Celtics’ Jessica Springsteen with RMF Zecilie and Denis Lynch with RMF Bella Baloubet - the only other double clear round of the day - and the St Tropez Pirates’ Athina Onassis with MHS Going Global and Edwina Tops-Alexander with California took the third spot, the team finishing on a single time fault. Rome’s Stadio dei Marmi was the backdrop to the penultimate leg of the Championship, which saw thrills and spills galore as the world’s top international horses and riders took to the picturesque sand arena. Lined with classic marble statues, the former Olympic stadium gave spectators a perfect view of the sporting action as the sun shone in Italy's capital city. Uliano Vezzani’s course was a class best suited to careful horses, a fast and forward going track but requiring plenty of control. The Italian course designer placed a tricky treble across the centre of the arena - two delicate verticals before a power-sourcing oxer to come out - and there was plenty for the horses to look at in the open arena. The final line caused the most problems, the GCL oxer set away from the in-gate, with riders given an option of taking a sweeping long route or a tighter, riskier turn. A Longines plank fell time and time again, but it was the penultimate fence, a skinny vertical that caught out the most, the fence potentially proving crucial in the overall Championship result. Jessica Springsteen and RMF Zecilie of the Miami Celtics produced the first clear, the team looking for a strong result to bolster their chances of moving up the overall rankings and into the top four - the prime position to fast-track to the GCL Super Cup semi-finals in Prague this December. She was swiftly backed up by Denis Lynch and RMF Bella Baloubet, the Irish rider taking the longer safe route to ensure the team could go through in the strongest possible position. And they delivered, the team the first to go double clear and making it look effortless. However it was anything but easy. Close rivals Shanghai Swans’ Daniel Deusser with Tobago Z and Pius Schwizer with Living The Dream picked up four faults apiece, both caught out by fence 12 - the penultimate challenge a grape-lined gappy vertical set alongside the beautiful VIP hospitality. There was delight for the Prague Lions, after Peder Fredricson pulled out a masterful clear with Hansson WL, the Swedish star proving yet again why he was such an important transfer into the team mid-season. He was followed by U25 talent Anna Kellnerova, the Czech rider putting in a confident clear with Silverstone G, the team the second to go double clear and delight written all over their faces. Valkenswaard United had closed the gap to overall leaders London Knights at their home event in The Netherlands the last time out, and the blue and orange team were keen to keep the pressure on their nearest rivals. But it came undone for Alberto Zorzi and Danique at the GCL oxer set away from the in-gate, the pressure landing solidly on the shoulders of teammate Bertram Allen and Molly Malone. But an early fault at the double - a wide oxer set along the grandstand - put them in trouble. Another pole put the team on a score of 12, with the team looking in danger. But agonisingly there was further drama after Molly stopped at the last minute at the grape lined vertical - the penultimate fence - Bertram looking winded as the pair regained their composure to come back around and finish their course. But it would be 14 penalties to add to Alberto’s 4, the team plummeting down the order and putting the favour firmly in the hands of their rivals the Knights. Home city team Rome Gladiators fielded their Monaco and Valkenswaard winning combinations of Constant Van Paesschen and Marlon Zanotelli. Constant took up the reins with his exuberant stallion Jilbert van' T Ruytershof, but it came undone at the GCL oxer, the pair crashing through the fence after a miscommunication. The duo recovered quickly to take the next skinny vertical, but the final fence tumbled, putting the team on a score of nine, after they picked up a time fault to boot. Marlon took centre stage with Rock’N Roll Semilly, but it wasn’t to be the Gladiators’ day, a further 8 faults adding to their score and putting the home team down the order. Mark McAuley and Miebello collected an unusual 28 penalties for the Montreal Diamonds, putting the team on the back-foot. However U25 rider Jos Verlooy pulled a clear out of the bag with Caracas, his top stallion jumping beautifully to try limit the damage to the team score. Madrid in Motion suffered the same fate, with a dramatic moment for Marc Houtzager and Sterrehof's Baccarat at the penultimate vertical, and a score to forget for Michael G Duffy and Lapuccino 2. Final team to go London Knights brought out two heavyweight riders, anchor Ben Maher with Explosion W and Olivier Philippaerts with H&M Legend of Love. First to go Ben set off with the 9 year old chestnut gelding, but there was disappointment as the GCL oxer fell, the back rail coming down to collect four faults. Olivier picked up the reins with top mare H&M Legend of Love, the small but quick striding horse taking on the fences with complete confidence and focus. The pair pulled it off, keeping the team on a score of four and within touching distance of a podium result tomorrow. With the Championship ranking at the forefront of everyone’s minds, a strong result tomorrow will be crucial for the final standing - Rome a crucial point as the series flies towards it’s finale in Doha. Tune in on Saturday 8th September at 12:45 local time via GC TV, or on the official GCL Facebook Live page to watch the action unfold.